Home / Blog / Surviving Irma and Maria – Click to read more! Irma. Maria. It’s safe to say that girls born in the Caribbean will not be given these names any time soon. Hurricane Irma was so powerful, that the National Hurricane Center is considering designating it a Category 6! Before setting her sites on the Turks and Caicos Islands, Irma destroyed Barbuda, St. Martin, St. Barths, Anguilla, and the US and British Virgin Islands. Two weeks later, Hurricane Maria decided to pay a visit. Maria was a Category 5, and many had no power or communications and were dealing with damage from Irma. There was still debris everywhere. This could behave like missiles and cause further devastation. Thankfully Maria only produced mostly rain and no further damage. Everyone was thankful to be alive! Everyone helped everyone clean up, rebuild, and upgrade. Although the media sensationalized the devastation, many areas got back to business quickly. On my first visit back to inspect Barefoot Palms Villa (a week after Maria), I dreaded what I would find. I drove the airport to Leeward heartbroken. Every roof had damage, landscape was brown and shredded. It looked like a war zone! But, every roof was already topped with either tarp, peel and seal, or a person hammering. When I got to the hub of Grace Bay Beach where all the resorts are, I found it already clean and nearly pristine. It had only been a week! I later discovered that everyone had stepped it up to pitch in. Some resort workers lost entire roofs, yet worked tirelessly to get resorts (and their jobs) up and running. When I arrived at Barefoot Palms, I thought, “I did better than expected, she’s still standing!” Yard was a mess, but that cleans up, right? A corner of the roof looked bad, but just a corner. And then I went inside. Wow. “Skylights” in every room. Furniture wilted and bubbled. Pool was black. My gorgeous Travelers Palm (the one that looks like a fan), had only 1 leaf in the middle. (Trying to tell me something?). Water streaks all up and down the walls. Appliances fried. All the fans fried. Not going to lie, I was overwhelmed. At least I had power. Some areas of the island didn’t have power for 2 months! Same areas took 10 months to get cable and internet back. I called my insurance agent, and he was very kind going through the villa with me. First order of business was a new roof and new tongue and groove. Everything else could wait. Not only did I have to hire all kinds of workers, but had to fight with the bank to release funds to fix things. It was like starting over! By the end of my first visit, hibiscus were blooming. Everyone was tired but smiling. By my next trip in December, the vacation areas of Grace Bay, Leeward, and The Bight were cleaner and fresher than ever. Nearly all my favorite restaurants were back in business, including Bugaloo’s and Da Conch Shack. Of course, the stunning turquoise sea and sugar sand beaches not only bounced back better than ever, but wider and prettier. Keep on coming to the Turks and Caicos Islands, and encourage family and friends to make it their next travel destination. 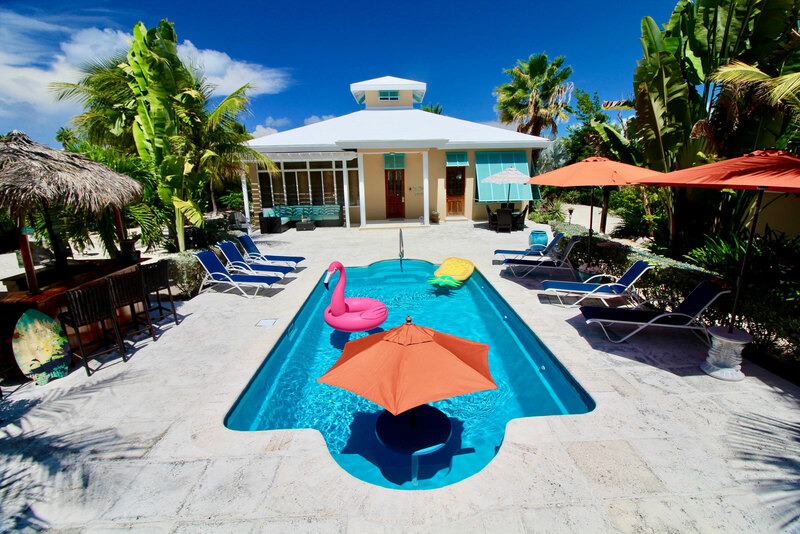 Tourism is TCI’s primary industry, and resorts, villas, restaurants, water sports, spas, car rentals, and so on, as they thrive it helps locals continue to rebuild and fix their personal dwellings. For many more pictures around the islands after the hurricanes, “Like Us” on Facebook, share this page (Icons below), and sign up for future blogs.